Mick Harford will remain in charge of League One leaders Luton until the end of the season. The former Hatters striker, who turned 60 today, will remain at the Kenilworth Road helm for the remaining 15 games of the campaign after impressing in the wake of Nathan Jones’ move to Stoke. 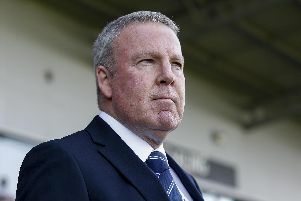 Since Jones’ departure, Luton have won five and drawn one of their six league games, extending their unbeaten run in the division to 19 matches. That has seen the Hatters move to the top of the table – six points clear of second-placed Barnsley, and nine clear of Pompey, who have a game in hand. When Jones left Kenilworth Road, the Blues led the way and were five points clear of Luton. However, while the Hatters have maintained their form, Pompey have suffered a blip – including a 3-2 defeat at Kenilworth Road on Tuesday, January 29. The Blues are next in action on Saturday, when they travel to Southend (12.30pm). On the same day, Luton travel to Fleetwood in a bid to maintain their lead at the top of the standings.